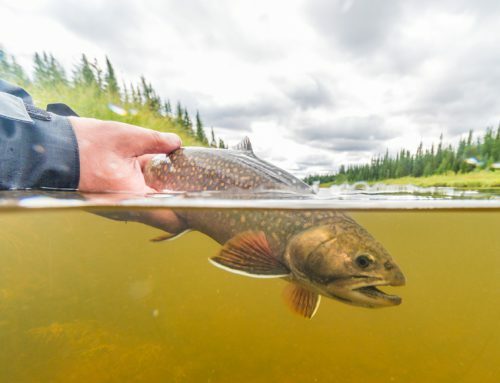 Corporate wilderness retreats have made a huge comeback over the past few years, especially at remote Canadian fishing lodges, and for good reason. Nature, physical activity, and team building without the hyperspeed distractions of today’s busy world, form an extremely healthy corporate cocktail when it comes to increasing productivity at work. 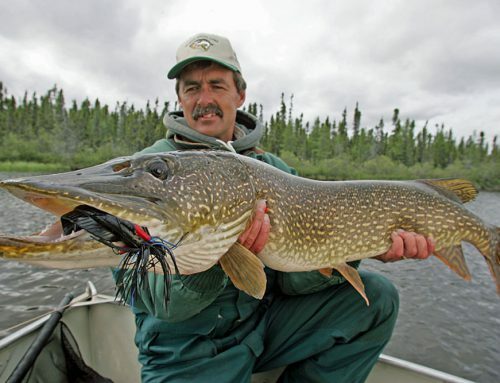 Webber’s Lodges has been successfully offering corporate fishing retreats highlighted by spectacular fishing and fine food in a remote wilderness setting for over 20 years at North Knife Lake Lodge. 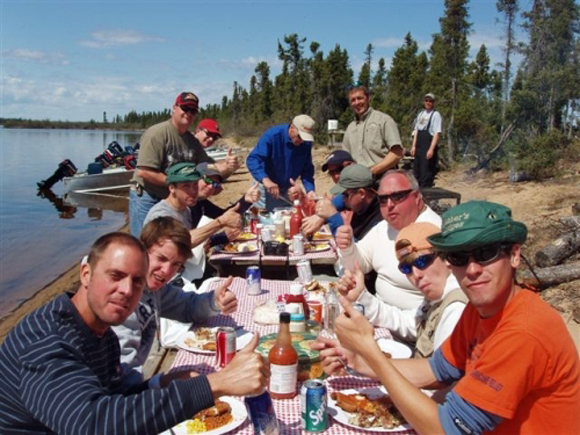 Clear thinking, creativity, planning for the future, team building and team bonding are priorities among our business clients, some of whom take over the entire Lodge for a week to 10 days, and the remote wilderness location of North Knife Lake allows nature to do its best work on both mind and body. 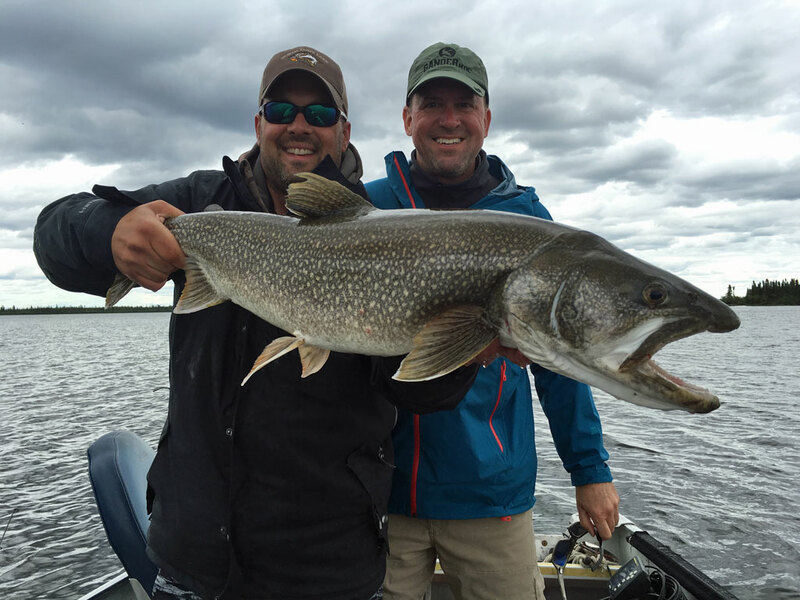 Guide Ryan Suffron and Jeff Vukelic (right) with trophy Lake Trout at North Knife Lake. The noise, information and social media activity surrounding businesses today saps energy and reduces productivity if a break isn’t taken. The need to unplug from our warp speed world and get back to nature has become a priority among many of today’s top business executives and their key stakeholders. Shore lunch at North Knife Lake. Research has proven that getting back to nature can boost attention spans and the ability to concentrate, and that time spent in the outdoors makes you feel healthier. It’s good for both your body and your brain. Even the colour green makes a difference, and exercise just seems easier in the outdoors. 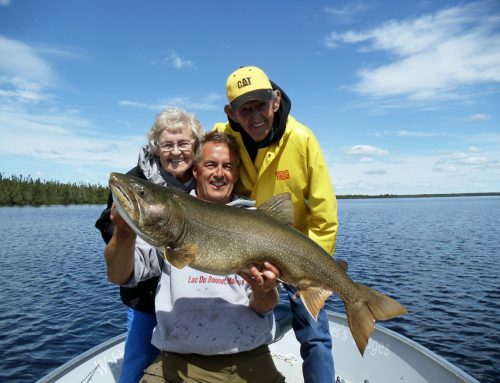 Your daily exercise regime at North Knife Lake Lodge includes climbing into a boat every morning and catching limitless numbers of big lake trout and northern pike. When you return to the Lodge after a day on the lake, the weight of the world will have been lifted from your shoulders. And not only will you think more clearly, you’ll also sleep deeply. Gene Vukelic, Chairman of Try-It Distributing Co. Inc. in Buffalo, New York, knows what nature can do for a company. Twenty years ago he was part of a large contingent on a Labatt-sponsored trip deep into the heart of polar bear country to see the great white bears on Canada’s Hudson Bay coast. The group stayed at a remote polar bear lodge near Seal River owned by the Webber and Reimer families. Mike Reimer and Gene Vukelic (right). Early days at North Knife Lake. 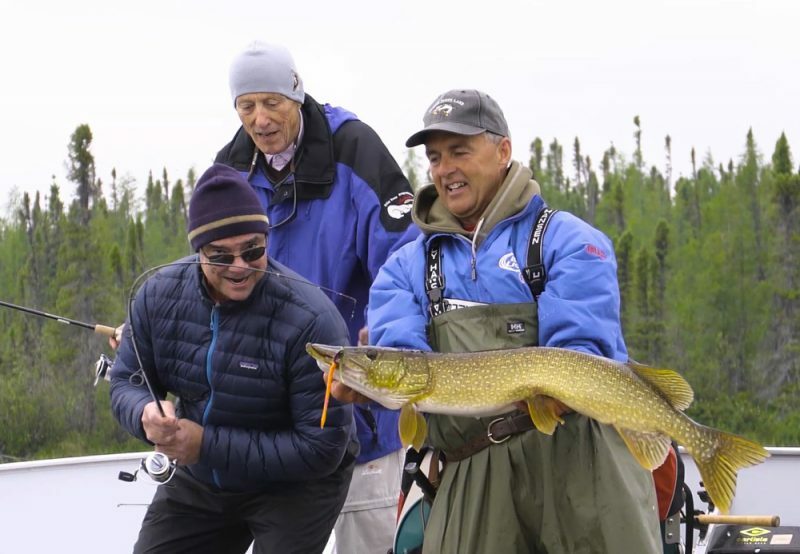 Two years later, Gene returned with his family for another trip with the Webbers and Reimers, but this time it was for a fishing adventure at North Knife Lake Lodge. 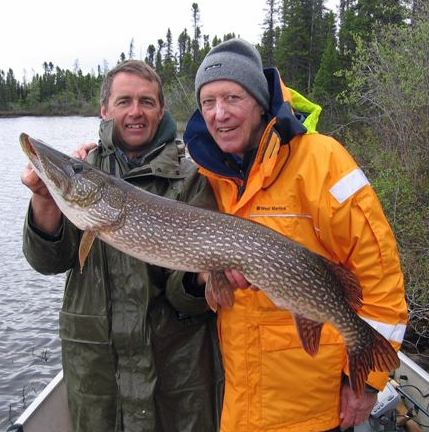 His family-owned company, the largest distributor of Labatt products in the world, has been coming back to fish with Webber’s Lodges ever since. Being enveloped in nature throughout the day while engaged in enjoyable physical activities results in deep restful sleeps at North Knife Lake Lodge, but there’s yet another reason you’ll feel rejuvenated here. The food served at the Lodge is based on our best-selling cookbook series Blueberries & Polar Bears, co-authored by Webber’s Lodges matriarch Helen Webber and Marie Woolsey. Only the best of the best recipes served at Webber’s Lodges since the late 1970s have made it into the cookbooks, and a fabulous meal after a day of pulling in one fish after another will put you in a rare and peaceful frame of mind. 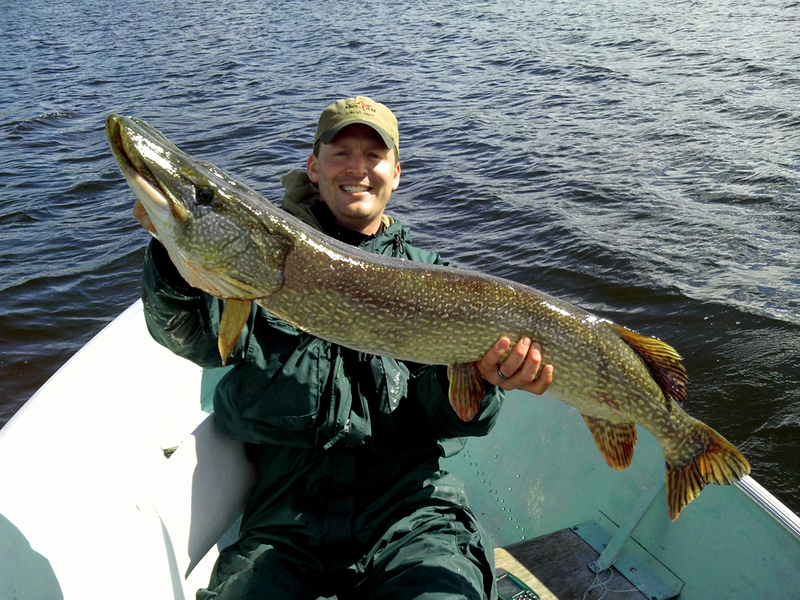 Jeff Knaebel with 47-inch Northern Pike caught with Webber’s Lodges. 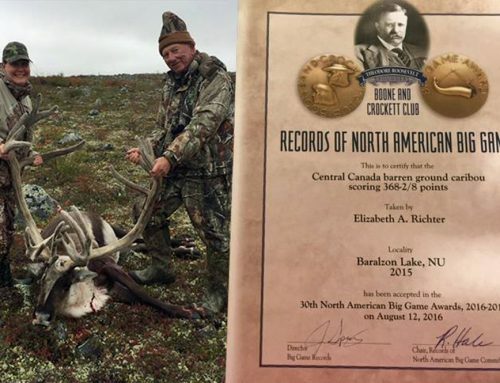 Only 48 people per year fish North Knife Lake. 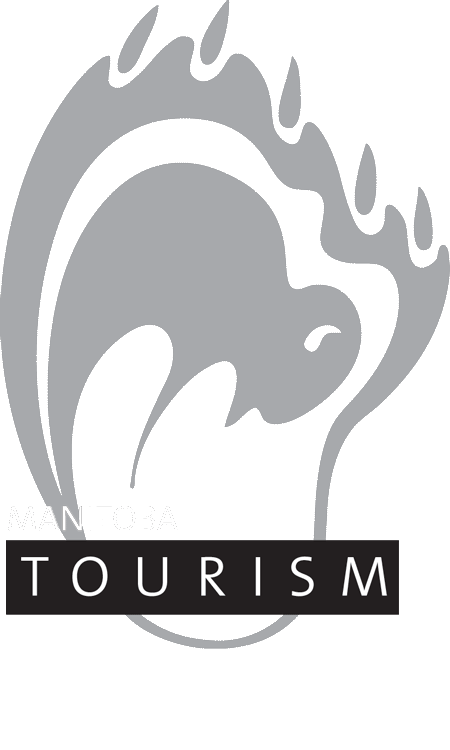 It is a rare and special place in this world, and we want to keep that way. Your group can have it all to yourself. Exclusive access. The Lodge can accommodate up to 20 guests at one time. And it doesn’t matter if you’ve never fished before, we have excellent equipment and guides who can help you land your first fish. You might even catch the monster of the day! It happens. Whether you’re relaxing around our conference table in the evening after dinner; participating in a skill building activity outdoors; watching an eagle soar gracefully overhead, or a moose and her calf strolling casually through the lake; enjoying the wood-fired hot-tub; engaging in a game of shuffleboard or pool in our games room; watching a movie or playing cards; enjoying a delicious shore lunch, or even holding a team meeting on an island (followed by an extremely refreshing swim! ); you’ll notice new relationships being formed and people starting to gravitate towards each other with thoughts and ideas that might just do wonders for your company in the future, not to mention injecting enthusiasm back into your workforce.